Is Macy's a Retailer or a Real Estate Company Sitting on a Property Gold Mine? Between 2015 and 2017, Macy's has brought in some $1.3 billion in cash from real estate sales. Is the company even a retailer anymore? Do you shop at Macy's Inc. (M - Get Report) for shoes and a suit, or maybe something heftier — floors in a commercial space or even an entire building? If you said answered "all of the above," you know more about this legacy retailer right now than most investors. These days, the property-rich Macy's is generating a huge share of bucks from real estate deals. Between 2015 and 2017, Macy's has brought in some $1.3 billion in cash from real estate, according to the company's Chief Financial Officer Karen Houget during an earnings call this week. Not chump change. By comparison, Macy's hauled in $3.7 billion in cash from its operations as a retailer. "In some ways, what Macy's is doing is taking unproductive assets, monetizing them and then using that capital to invest in future growth initiatives," Neil Saunders, managing director of GlobalRetail Data told TheStreet. Among Macy's recent real estate deals is one for $30 million to sell the top seven floors of its Chicago store on State Street to a private real estate fund sponsored by Brookfield Asset Management. The deal is expected to be completed during the first half of this year. This showcase location within the "Loop" Retail Historic District was the flagship store of Marshall Field and Company, a Chicago-based department store chain Macy's bought in 2005, and features a Louis Comfort Tiffany mosaic vaulted ceiling dome, among other fanciful trims. Are Macy's and Other Struggling Retailers Finally a Buy? In March 2017, Macy's sold a downtown Minneapolis store for $59 million, following sales announced in January 2017 that brought in $95 million in cash for one store each in San Francisco and Portland, Oregon. Also in San Francisco, Macy's has been active with its real estate holdings at Union Square, one of the city's main hubs. Macy's owns multiple buildings there and has sold one — the 243,000-square-foot men's store for $250 million — with plans to sell another. The men's store will be incorporated into the Union Square main building and feature street-level space for high-end upscale retail shops leased to third-parties. It is holding onto the main building, which at 700,000 square feet will be the largest department store in the Bay Area, according to Macy's. For sale also is a building that used to house the flagship store of I.Magnin, a luxury department store chain based on the West Coast. In the late 1980's, I.Magnin became part of Macy's, and in 1999, Macy's physically joined the flagship store with an adjoining building. Now, Macy's is separating those two and selling off the 240,000-square-foot I.Magnin portion, which CFO Houget said during the earnings call is part of San Francisco's colorful retail history. Macy's hopes to sell it by the end of this year. 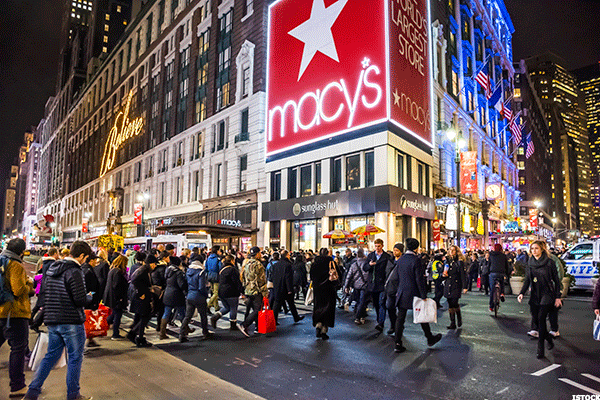 Macy's prized possession: its iconic Herald Square store in New York City. Houget said that an alliance with Brookfield to redevelop 50 properties has so far zeroed in on nine properties. If those were sold, added Houget, "the cumulative value of these nine properties is estimated to be approximately $50 million, plus a retained participation in the upside profits of the three largest assets." While none those stores would close, she said, they would be reconfigured in different ways. Raking in dough isn't the only advantage to teaming up with Brookfield. "The benefit of the Brookfield partnership is mostly that Macy's can focus on the day-to-day running of the business," said Saunders, "while letting Brookfield take care of property disposals and asset monetization." Saunders added that Macy's is using the sale of its real estate assets like a "war chest" to rebuild its business. In addition, Macy's is still exploring what to do with its iconic Herald Square location, which takes up an entire city block of prime midtown Manhattan real estate. The flagship location is worth some $3 billion, estimated Adelaide Polsinelli, a senior managing director and principal of real estate investments firm Eastern Consolidated. Ka-ching! Even though Macy's real estate assets are helping the company through a rough patch, said Saunders, it is not the solution: "Macy's is a retailer, and it needs to get the retail side of its business right."